Go there as long as it's possible! We booked 4 days and stayed longer than two weeks! We loved this place and can really recommend it if you are searching for a really cozy place to stay. The staff is awesome, the food is amazing and cheap, the beach is across the street, the beds are really comfortable and the atmosphere is amazing. Btw Paul creates the best cocktails. We wish the staff all the best for their future! Wonderful hostel! Very great chillout area, good food, great staff. Great to meet people and the beach is just across the street. Would definitely come back! It’s a really cool hostel directly at the beach with great vibes. Even though I think that it’s a bit too expensive. It’s 2km away from Otres Village. Tolles Hostel am Otres Beach. Schön ist die Terasse und Bar. Dort kannst du abhängen und lernst auch viele Backpacker kennen. Der Staff war sehr freundlich. Wer es gerne leise möchte ist am falschen Ort da die Musik schon manchmal etwas länger laut sein kann. Das Essen ist sehr lecker und jeden Dollar mehr Wert. Nice location directly next to the beach and a bit away from all these upcoming casinos and giant hotels. Chilly backpacker hostel with relaxed staff and amazing food! Try the shakshuka, you won't regret it! Toilets are combined with showers, so it's always a bit wet and sandy there. Don't expect a 5*-cleaning level, but this hostel doesen't need that at all to be a lovely place to stay. We had a good stay there! Nice staff, nice food! Only for party people! 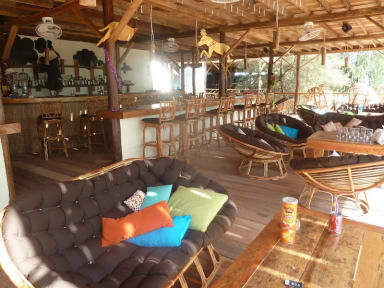 The Location is great, also the common room and bar. Staff is friendly and helpful. BUT:it is not possible to sleep without ear plugs, since the sleeping rooms are located right over the bar. They play loud music til 3 at night or even longer. In the last evening it was raining for half an hour despite of high season. My bed in the dorm was a bit wet. Fortunately I had a sleeping bag with me. Sehr alternatives Hostel, viele Kiffer. Zum Glück gibt es Mosquito Netze über den Betten! Cocktails sind ganz gut. Essensauswahl war sehr sehr nice. Tiere laufen auch überall Rum.